They are a great source of vitamins, minerals and fiber. In addition, they contain tannins, which have anti-inflammatory action. Fruits stimulate the secretion of stomach, pancreas, and gallbladder, as well as ensure the normal functioning of the gastrointestinal tract. To get the maximum benefits for the body, they need to eat at certain times. In the cold season, pay attention to the fruit, rich in vitamin C: kiwi fruit, and various citrus fruits (oranges, lemons, grapefruit, mandarins). Their use enhances immunity and prevention of hypovitaminosis. Bananas, pomegranates, feijoa and quince will help to replenish potassium, iron, magnesium and iodine. Spring and summer give preference to seasonal berries and fruits produced in the area where you live. Cherries, strawberries, currants, cherries, gooseberries, raspberries, pears and apples – these gifts of nature are very rich in vitamins and minerals. Do not miss the opportunity to pamper your body with these useful Goodies. Eat them raw, cook desserts, and vitamin cocktails. 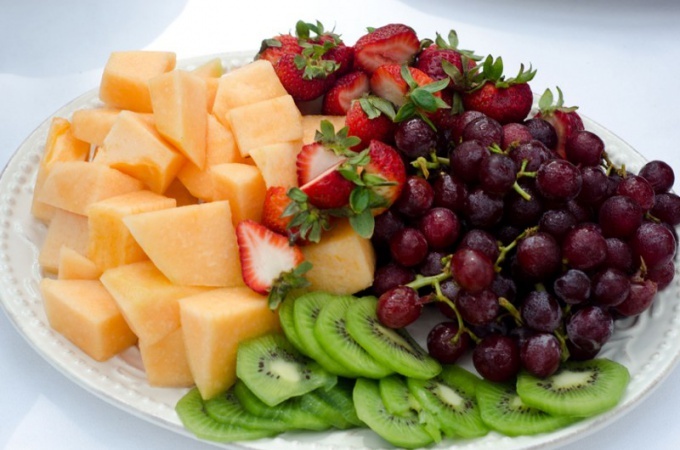 Fruit is best eaten on an empty stomach or at least one hour before lunch. The basic rule for normal digestion – eating raw fruits and berries in about three hours after the main meal. In this case, you will not have any discomfort and feeling of heaviness in the abdomen. Start the morning with citrus. 20-30 minutes before Breakfast, drink orange juice, eat a tangerine or kiwi. In kiwi fruit contains 5 times more vitamin C than oranges. Fans of the apples it should be remembered that these fruits cause copious juices in the stomach, therefore, nutritionists advise to eat before and after lunch, one Apple. For people leading a sedentary lifestyle and suffering from sluggishness of the bowels, will be very helpful to eat 1-2 plums 3 hours before bedtime. If you are engaged in heavy mental work, you need during the day to support your brain in working condition. This will help you grapes. It is rich in glucose and sprigs of grapes of about 200 g or handful of raisins will be sufficient for your creativity never waned. It is advisable to fresh fruits and berries present in your daily menu, in this case, you will provide your body with vitamins, nutrients and fiber.